You are here: Home / giveaway / 25 Days of Christ :: LDS Advent Calendar Giveaway! We’re always looking for ways to make the Christmas holiday more Christ-centered in our home. With young kids it’s so easy to get caught up in the elves, jingle bells and bright, shiny toys that typically represent this holiday. So when I came across this 25 Days of Christ LDS Advent Calendar kit, I knew it would be a perfect way for our family to center on the life of Christ during this time of year. When I received the kit in the mail it had everything I needed to get going – the wood pieces were all cut and sanded, twine was provided for hanging the ornaments, and any fabric I needed was neatly folded and ready for me to cut. The only things I needed to provide were the paint, paintbrushes, sandpaper for antiquing, a glue gun, and a thin black marker for adding eyes to the people – all of which I already had at home. It also comes with a drawstring bag to hold all the ornaments for safe keeping. 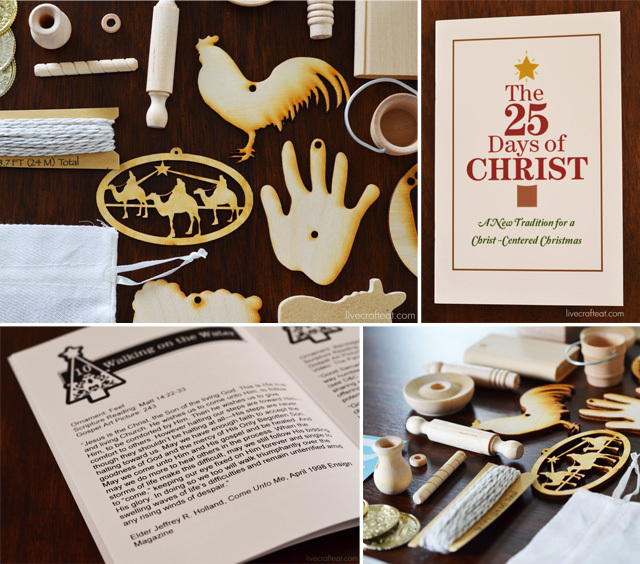 To go along with each ornament, there is is a book full of stories about Christ – one for each of the 25 days. This is a picture of all the ornaments/pieces included in the kit. If you want to see each individual ornament and it’s accompanying story, visit the 25 Days of Christ site to see all 25 days. …and assembling. A glue gun is all that’s required. And there are only a few ornaments that need to be assembled at all. Every ornament is pictured on the 25 Days of Christ website, so it’s easy to look it up and reference what you’re doing. It’s really straightforward and is so rewarding when you’ve finished! Starting December 1st, we read one story from the booklet provided with the kit (there are also talks from General Authorities, scriptures, and other resources listed that can be found at lds.org), and then hang the accompanying ornament on our tree (or on a line, like in the picture above). By Christmas Day, we’ll have read and learned about 25 different stories of Christ’s life, and will have 25 “made by us” ornaments hanging on our Christmas tree reminding us of those events…and the real reason for the Christmas season. These kits are already sold out this year – that’s just how popular they are! BUT we’ve saved one for a lucky Live Craft Eat reader to enjoy this December. To enter the giveaway, follow the prompts at the bottom of this post – the more things you do, the better your chances are of winning! Can’t get one this year? Don’t worry! There’s a waiting list for next year! And believe me, it is definitely worth the wait! You can find more information on the waiting list by clicking on this link to 25 Days of Christ – waitlist 2014. I was given a free 25 Days of Christ kit/calendar to facilitate this review/giveaway. Nonetheless, all opinions are 100% my own. Here are the contest rules: Contest will end at midnight on Thursday, November 14th, 2013. This contest is open to residents of U.S. AND Canada! Winner will be contacted by email. Because of the tight schedule (we want to get this to the winner before December 1st! ), if the winner doesn’t respond by email within 24 hours, a new winner will be selected. Good luck! so dang cute — my mom served her mission in France and every year on Christmas Eve, she’d make a traditional Yule Log. mmm, i can still taste it now just thinking about it. One Christmas traditon we have is opening our favorite cereal on Christmas Eve. That box is all ours, and we don’t have to share! We make Christmas cookies together as a family a couple of weeks before Christmas. I remember every Christmas Eve going around caroling to family and friends and giving presents. I love how it set the right mood for Christmas! My mother took us to have our picture with santa every year going up and I continue this tradition with my own kids. I’ve heard a lot about your blog but just came across it for the first time. There are so many great things and I am excited to follow you!! LOVE this advent calendar. I am excited to start traditions with my own young family, espcially those of service. We always do the 12 days of Christmas for families in need. We have always gone to church as a family. It’s a tradition I look forward to. A tradition we started is to read the Christmas Story. We like to give gifts of service to others! We always have a big family breakfast on Christmas morning. One childhood memory I have is every Christmas Eve, my family and I would go to the 11 PM Christmas Eve service, then home come to hot chocolate and before going to bed, we would listen to my father talk about the birth of Christ. My dad passed away last year and this is a fond memory that I will cherish for the rest of my life and a memory that I would like to share with my granddaughter. Thank you for offering this wonderful giveaway! making crafts with my son that teach about Jesus’s birthday, decorating the tree together and we visit with lots of family! We dont have any taditions. I’d like to win this for my friend as a present. LOVE! We always enjoy our church Christmas play each year – hot chocolate, fun, family and friends! Thanks so much for the chance to win! I have a Christmas bucket list we like to use each year. It helps us remember to include all the fun things we say we want to do all year long (at Christmastime). We always went to the Christmas Eve service at church. Christmas dinner with family is our tradition! We go to a Christmas parade in town together. Every year we open gifts one at a time, one per person youngest to oldest until they are all unwrapped, thanking the giver, if they are present at that time. We then jump in the pile of disgarded wrapping paper (the same way you would jump in a pile of leaves). This is the best part! It keeps the kids (and some adults) from putting too much focus on what gifts they received and more on having fun with family. Every Christmas Eve my adoptive family would always buy us pajamas and we would all sit down together and watch a Christmas movie! We have birthday cake, and sing Happy Birthday to Jesus. We enjoy setting up the tree and talking about the different ornaments. I love going to church on christmas eve and spending lots of time with family! One of my family’s Christmas traditions is all the children get together and decorate Gingerbread Houses. Hey…. is anything like this available to buy anywhere? Now that’s it two years later….. If it isn’t available on the original website I linked to I’m not sure Sabra. HTH. Katie.